Where was this window originally? 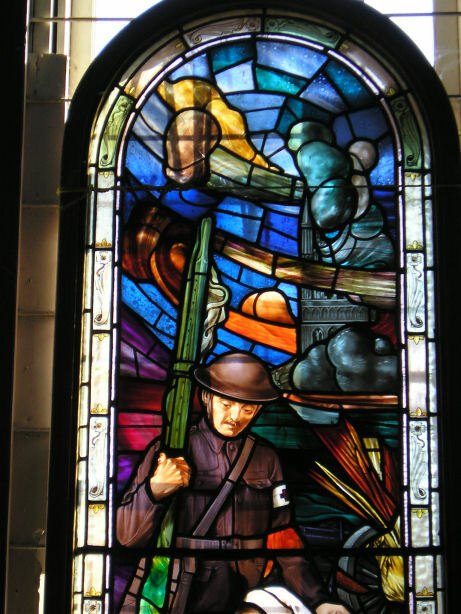 I'm putting this image on the website in the hopes that someone somewhere will know where this beautiful stained glass window was originally located. It is currently for sale in an antique shop on Vancouver Island, British Colombia, Canada. The owner has been unable to get much info on the window other than that the window came from the north of England, shipped to Vancouver B.C. in 1969 and until quite recently had been in storage before being brought over to the Island. 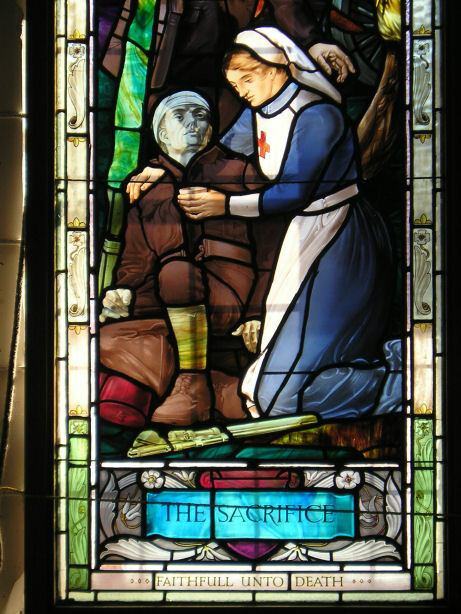 The window looks to be a memorial or tribute to the WW1 medical services. It measures approx. 6' x 2' and is titled "The Sacrifice - Faithfull unto death" and is in excellent condition. Such windows were often removed during WW2 for safe keeping. It was for some reason never replaced in its original home. Being such a special window I'm sure it has a story to tell. Maybe one of the many visitors to this website might recognize it or have some information to share. Anyone with info can contact us via the Visitors' Book. Click on the images to enlarge. You may need to click again when the larger images appear. Here are larger versions of the window. They are beautiful, aren't they! Many thanks to Steve Hughes on Vancouver Island who provided these images and who set this trail going. http://1914-1918.invisionzone.com/forums/index.php?showtopic=133227&hl=. There are already some interesting and helpful responses. I like the idea, from 'ianw', that the window could find its way to the RAMC museum.